As Director of Permanent Search at The Mason Group, I have a front row seat witnessing accounting professionals grow and thrive in their careers. This includes talent a few years in, or candidates with decades of experience. Helping finance professionals reach their optimal career potential and connecting them with job opportunities they may not have found otherwise is very rewarding! With over a decade of experience in the recruitment industry, I’m happy to share some tips and tricks accounting and finance professionals can use to stand out in a job interview in order to showcase the best version of themselves under pressure. To demonstrate your interest in the position and your engagement with the company, read up on the company and understand the responsibilities of the job description. Review the company’s website and note general information, activity and history, recent press coverage, industry benchmarks, news reports … specifics you can find that are relevant and can be easily woven into your interview answers. Review the interviewer’s LinkedIn profile, DO NOT add them as a connection! What are the most important skills for someone to excel in this role? What would be my first project should I get the job? Before your job interview, have your answer for compensation expectations ready and if asked, avoid giving a salary range. The interviewer will only hear the lower number. Provide precise numbers instead, such as: “I would require an $80K base salary plus a 10% bonus.” Say it and pause. Let the interviewer resume the dialogue. Last but not least, don’t ask questions about vacation policies, working hours, or compensation (nothing “me” focused), but be prepared to answer these questions if asked. Always be prepared for technical (accounting and finance) questions, as well as behavioural questions. To prepare for technical interview questions, closely review the job description and find relevant examples from your current job and/ or training or education. Find sample behavioural questions and practice by ‘walking through’ them. Prepare a few detailed examples ahead of your job interview. You don’t want to memorize or sound rehearsed, you do want to have concrete answers with detail and substance. A good way to answer behavioural interview questions is the STAR method in which the interviewee answers by describing (1) the specific situation (2) the task (3) the action, and (4) the result. The goal is to readily bring to mind past experiences, enabling you to carry out the interview in a smooth and confident manner. Whenever you can, include tangible metrics in your answers (size of team, dollar values, etc.). Try to think of examples that are relevant to the job you are interviewing for, wherever possible. If you haven’t done something that is being asked, tie in an example of something you taught yourself, or when you hit the ground running. Check out Sample Interview Questions for a comprehensive list of behavioural questions that could come up during your job interview. While giving detailed answers, never give a ten-plus minute answer to one question. Pause, check in with the interviewer, ask if they would like you to go on, “shall I elaborate?”. You don’t want to lose them in a long-winded answer. Sometimes a first round interview is as short as half an hour. Remember you can only score 30% if you only answer three out of ten questions! Always take a friend, recruiter, HR professional, or mentor up on a prep-call offer or ask someone to rehearse with you (you can give them sample interview questions from Google). Work out various job interview scenarios and interviewer styles. Practice enough so that you feel confident, but be careful not to sound like you memorized your answers. The goal is to jog your mind ahead of time to sound prepared but not rehearsed. You never want to walk out of an interview wishing you said something else. Dress for the job you want. Make sure you look professional, put together, well-rested, and avoid wearing strong perfume or cologne. Stay neutral and dress appropriately for the job you are interviewing for. For example, opt for a full suit to make a strong first impression when interviewing for a job at a conservative bank institution. Alternatively, choose more casual attire when applying to join a millennial-founded tech start-up. When in doubt, overdress. You never want to be late for a job interview. Bearing this in mind, give yourself a lot of EXTRA time for subway delays, traffic, accidents, construction, trouble finding parking, and/or the office building. You may go to the floor of your interview, but do not introduce yourself at reception more than 15 minutes ahead of schedule to avoid appearing disruptive or rude (people feel they need to meet you earlier, which could lead them to feel rushed). From the second you step into the elevator, remember to treat EVERYONE you meet as an important part of the interview process and showcase your best manners. Always make eye contact with the people you meet, be friendly to the receptionist (don’t just sit in the lobby and stare at your phone!). Eye contact reveals self-confidence and further engages the interviewer in what you’re saying. Often senior decision makers will ask reception what they thought of a candidate. Be confident, polite, engaged and well prepared. Learn to play up your confidence and experience without being cocky. Speak to your successes and accomplishments. Sell yourself. 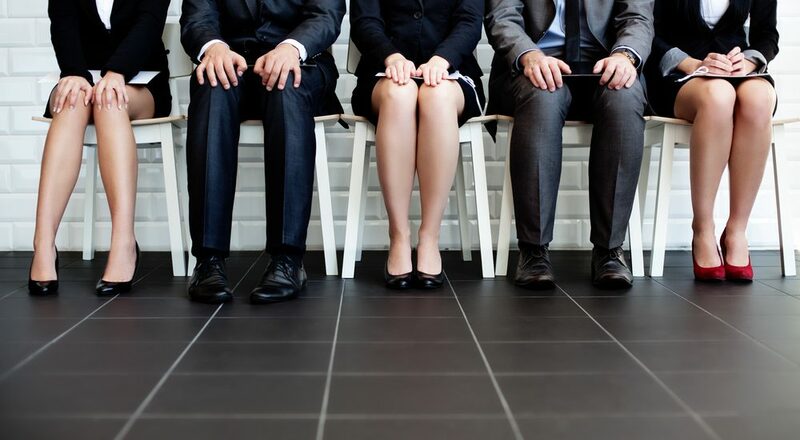 You can decide after the job interview if you want to move ahead in the process. The goal is to make the interviewer want to hire you. Don’t act entitled, and don’t make the interviewer feel they have to sell you on the opportunity (ideally this will happen naturally, especially when you ask questions at the end). Throughout the interview, show strong interest in the industry and the company, as well as your understanding of the responsibilities the job entails. To demonstrate yourself as a strong fit and a successful candidate, weave in details about your skills and past work experiences that highlight how qualified you are for this specific role. Be as clear and concise as possible in your answers and stick to the questions asked. By being brief and to the point you let the interviewer guide the flow of the interview. As noted above, if you feel more could be said on a subject, pause and ask, “shall I go on?” and let the interviewer decide if he or she wants to hear more on the matter. Avoid answering the first question with your life story. If the interview starts with “tell me about yourself,” answer with your clear and concise two-minute elevator pitch that highlights your career’s story, and why you want this job. Most job interviews end with a question period in which the roles are switched and the candidate gets to ask the questions. This is the perfect time to 1) ask the questions you have carefully prepared beforehand and 2) inquire about next steps. Always send a thank you email the same day/night you had your job interview (unless a recruiter advises you not to). In the email, make sure to thank the interviewer for their time, touch on one thing you think they really liked about your experience and reiterate your strong interest in the position. Don’t be too verbose, and don’t expect a reply (no reply is not necessarily a bad sign, remember the interviewer is busy and they are often meeting multiple candidates). If the hiring manager did not share their contact information during the interview, send the email to your recruiter to forward. An interview is a job seeker’s moment to shine. Being prepared, confident, and calm is essential in securing a positive first impression and moving to the next round. Check out these 8 tips to remain calm during an interview for more tips. Katherine Marr (Duncan), CPA, CA is Director of the Mason Group’s Accounting and Finance Permanent Division in downtown Toronto. Her keen interest and genuine excitement for the recruitment process and offering career guidance made her transition into the recruitment industry in 2006 after completing her CPA, CA at PricewaterhouseCoopers. Passionate in all her endeavors, she has lived and worked in London, San Francisco, Los Angeles, and Toronto, has travelled to over 30 countries spread across all continents, climbed Mount Kilimanjaro and Everest Base Camp, and slept overnight in Antarctica! You may reach Katherine at 416-572-5261 or by emailing kmarr@masongroup.ca.